She doesn't know where his father is. We are told that Fackson has always been healthy, except for being hungry. Food is a problem for the family. They usually eat once a day, but sometimes go the entire day without any food. Frackson's aunt says that education would be a problem if it weren't for RHO Appleseed School. 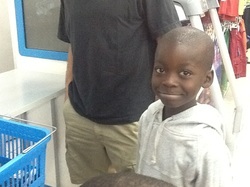 We were able to take Fackson shopping for clothes and shoes, thanks to his sponsorship. He had a great day of firsts. First time in a shopping mall, first time on an escalator and an elevator, first time buying new clothes, and many more!